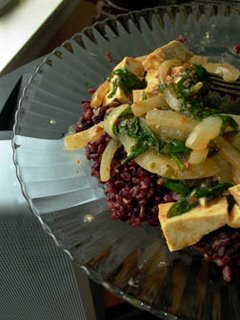 Recipes with purchased sauces: Tofu with Spinach and Onions in Thai Peanut Sauce. Heat a little canola or peanut oil in a wok, and add the sliced onion when it's hot. Sauté the onion over medium-high heat for two or three minutes before adding the tofu. Mix well, lower the heat, and cover for about 5 minutes, stirring occasionally. Add the spinach and peanut sauce, and mix well. When the dish smells too good to wait any longer (about 12 minutes of total cooking time), serve over hot rice.